EBITDA at Rs.6,522 Cr (8.5%), EBIT (0.1) %. (down 370bps) impacted by Weak sales in China and de-stocking. –	Jaguar Land Rover: Performance impacted by corrective action in China and production shutdown. Retails down 6.4% to 144,602 units; Wholesales (incl CJLR) down 11.0% to 141,552 in Q3. Challenging market conditions in China. Investments: Rs. 1.4K Cr in products and technologies. Free cash flows of Rs. (1,537) Cr. In Q3 FY ‘19 wholesales (including exports) declined 0.5% to 171,354 units on the back of challenging market conditions in the domestic market. In the domestic market M&HCV trucks de-grew 15%, ILCV trucks +8%, SCV & Pick Ups +15% and CV Passenger -16%. PV was up 3% with new products continuing to gain strong traction in the market. In the quarter, Revenue increased 1.5% to Rs.16,208 Cr, Pre-tax profit at Rs.519 Cr (against Pre-tax profit of Rs.239 Cr in Q3 FY 18). Pre- tax profit for the quarter includes provision for impairment of intangible assets under developments of Rs. 24 Cr and foreign currency revaluation gain of Rs.181 Cr (against NIL impairment charges and Rs.70 Cr of foreign currency revaluation gain in Q3 FY18). Profit after tax for the quarter was Rs.618 Cr. For Q3 FY 19, Retail sales were 144,602 vehicles, down 6.4% year-on-year primarily as a result of continued challenging market conditions in China, offset partially by encouraging growth in North America and the UK. The company’s sales in Europe were up slightly, despite an 8% drop in the overall market. In the three-month period, sales increased for the new Jaguar E-PACE and Jaguar I-PACE as well as the refreshed Range Rover and Range Rover Sport, while the slowdown in China largely accounted for lower sales of other models. The company reported revenues of £6.2 billion and a pre-tax loss before exceptional items of £273 million (EBIT margin -2.6%) for the quarter. The financial results mainly reflect the lower sales in China and higher depreciation and amortization of investment expense. The third quarter was also impacted by one-off factors including costs related to planned reduction in inventories, warranty reserve adjustments and currency and commodity revaluation. As part of its plans to achieve £2.5 billion of investment, working capital and profit improvements by March 2020, Jaguar Land Rover announced in January that it would reduce its global workforce by 4,500 people. This is expected to result in a one-time exceptional redundancy cost of around £200 million. The EBIT margin for the full financial year ended March 2019 is expected to be marginally negative which will result in a loss before tax for the year before exceptional items. Jaguar Land Rover opened the new manufacturing facility in Slovakia at the end of October, where production of the Land Rover Discovery has now begun. Total investment spending for the quarter was £1 billion and cash flow after this and £242 million of inventory improvements was negative £361 million. Jaguar Land Rover ended the quarter with £2.5 billion of cash, after repaying a $700 million bond which matured in December. The company also had a £1.9 billion undrawn credit facility available at the end of the quarter. Prof. Dr. Ralf Speth, Jaguar Land Rover Chief Executive, said “Jaguar Land Rover reported strong third quarter sales in the UK and North America, but our overall performance continued to be impacted by challenging market conditions in China. We continue to work closely with Chinese retailers to respond to current market conditions with a ‘Pull’ based approach to vehicle sales. Today, we are also announcing a non-cash exceptional charge to reduce the book value of our capitalised investments. This accounting adjustment is consistent with the other decisive actions that we must take as part of our ‘Charge’ and Accelerate transformation programmes to create an efficient and resilient business, enabling Jaguar Land Rover to counter the multiple economic, geopolitical, technological and regulatory headwinds presently impacting the automotive industry. We are taking the right decisions now to prepare the company for the new technologies and strong product offensive for the future. This is a difficult time for the industry, but we remain focused on ensuring sustainable and profitable growth, and making targeted investments, that will secure our business in the future”. Finance costs increased by Rs.321Cr to Rs.1,568Cr during Q3 FY’19 vs same quarter prior year. In the quarter, Net loss from joint ventures and associates amounted Rs.138Cr compared with profits of Rs.253Cr in prior year. The decrease is coming mainly from the lower profitability in the JLR’s China JV (CJLR) due to market challenges. Other income was Rs.266Cr versus Rs.182Cr in the same quarter prior year. 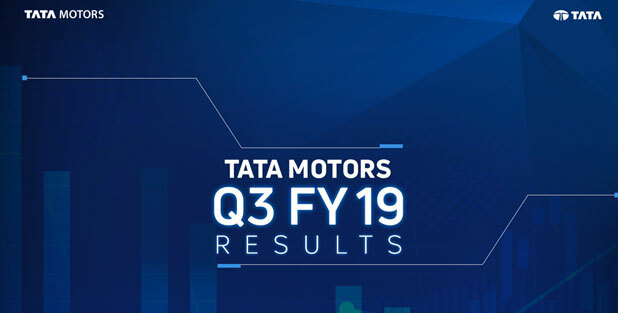 Free cash flow (automotive) in the quarter, was negative Rs.5,228 Cr reflecting lower operating profits at JLR and negative working capital arising out of temporary unwinding of creditors at both TML(S) and JLR.